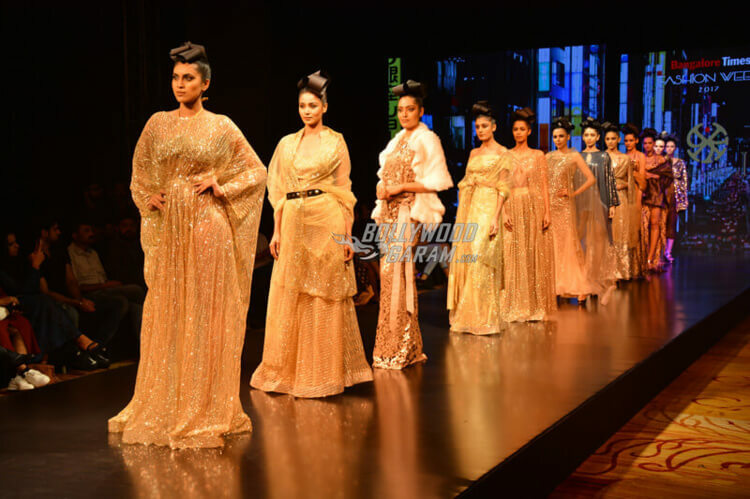 Bengaluru’s two-day fashion event, Bangalore Fashion Week 2017 at JW Marriott was an extravagant and lavish show with top designers of the country taking it as an opportunity to showcase their exquisite collections while there were models, actresses and other popular celebrities at the event too who looked fabulous in the designer wear that they walked the ramp in. 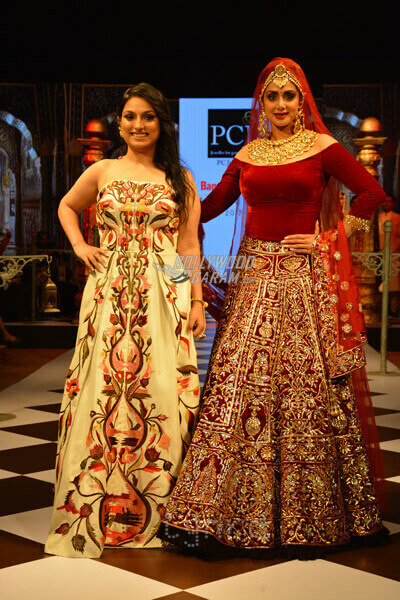 However, it was Sridevi who stole the show and looked ravishing in a red and gold bridal wear lehenga paired with a boat-neck and off-shoulder red choli, fancy net dupatta with accessories – designed by Nupur Vasdev, complete with heavy embellished gold jewellery by PC Jewellers that included a matha patti, danglers and a big neckpiece. 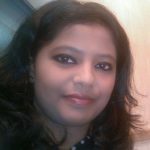 The red dupatta was worn over her head and tied with the matha patti, showcasing an entire rajasthani traditional bridal wear outfit. 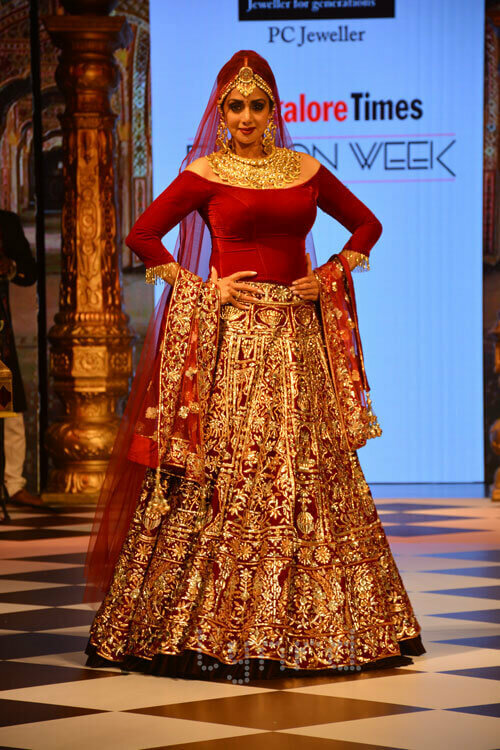 The Mom actress managed to grab eyeballs in her breathtaking appearance while endorsing the bridal jewellery and couture collection ahead of the wedding season this year. She looked every bit of a royal personality in the Rajputani attire and her appearance at the fashion show couldn’t have been any grander and regal as she turned out to be quite the showstopper on Saturday, October 7, 2017 with designer Nupur Vasdev. Along with Sridevi, actresses Ragini Dwivedi, Shruti Hassan, Femina Miss India Indore 2013, Zoya Afroz, Kannada film actress, Aindita Ray and former World No. 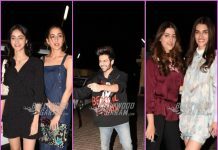 1, Badminton champion Saina Nehwal among others were some popular celebs who graced the event. 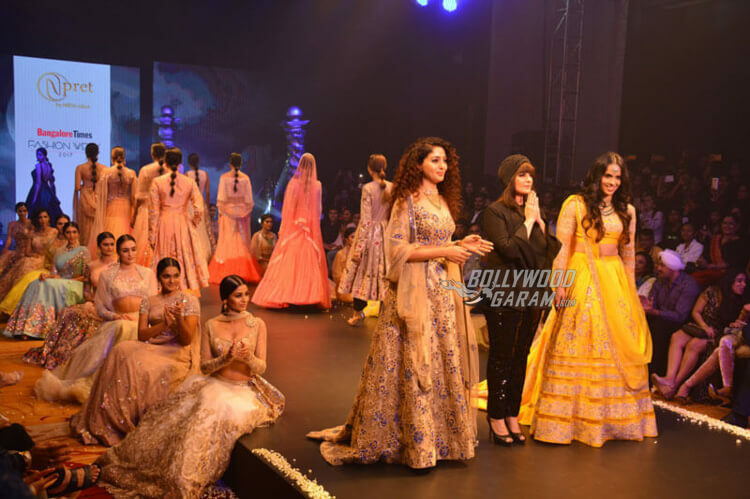 Designers Neeta Lulla, Manoviraj Khosla, Nandita Mahtani, Dolly Sidhwani, Pria Kataria Puri, Narendra Kumar were some of the ace designers who walked the ramp along with their models and showstoppers. 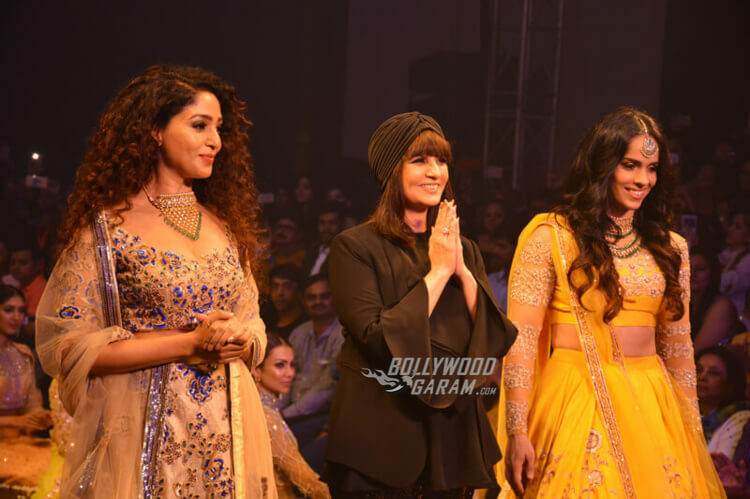 Saina Nehwal who walked the ramp for Neeta Lulla and turned out to be the showstopper on Day 2 that is October 8, 2017 at the fashion event looked surprisingly radiant and ethereal in a bright yellow lehenga choli with silver embellishments, teamed up with a matching maang tika and a neckpiece. 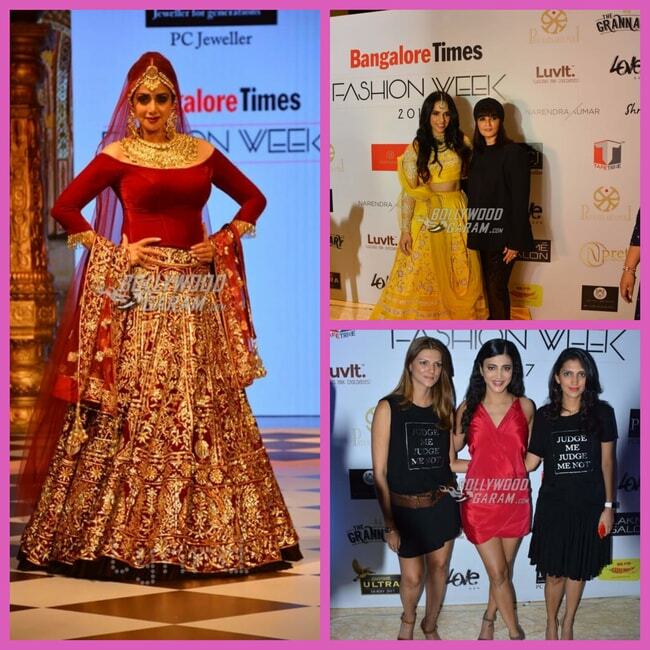 Exclusive photos from the Bangalore Times Fashion Week!